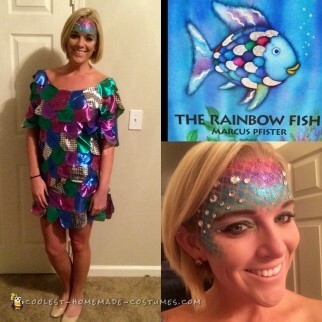 For someone who knows how to sew, this Rainbow Fish costume would be a lot easier to make… I unfortunately do not. The fabric I found at Jo-Ann was perfect for the colors of the gills. The only problem was it frayed really bad so I also have to buy a bottle of the anti-fray gel which added a long step in the middle. I first made a gill pattern and then cut out 50+ of each color, blue, green, purple, pink and the shiny piece. I decided to make them bigger so I wouldn’t need to cut out as many. For the dress, it was an old dress I used in a previous (fox) costume so I didn’t care what happened to it afterwards. As I mentioned above I don’t know how to sew so I decided to staple each gill to the dress (to get the middle ones, I put a metal cookie sheet in between the layers and just pushed the stapler has hard as I could). I laid the rows out so they weren’t lined up vertically and had a nice overlap. There is no order to the colors at all. I just tried my best to not have 2 of the same colors touch. Once all the gills were stapled, I went thru with fabric glue and just made sure they were all pretty secure. The make up was fun… I have never tried to do costume makeup before so I did 2 test trials the week before to be sure I could pull it off. I bought purple, teal and blue “tattoo” eye shadow… I forget what brand but it was from CVS. I also bought purple, blue and pink sparkles. To apply the make up you just put fishnets over your head and pull as tightly as possible (for larger gills) and I applied the eye shadow onto my forehead starting at the eyebrows with teal then blue etc. almost in a rainbow style. Make sure you hold the fish nets tight and in place for solid lines. After I applied the eye shadow, I went back over and covered each color with glitter. Remove the fishnets and taaa-daaaa. Apply a bunch of gems for effect and boom all done. If you have long hair a fishtail braid would look really cute. I got a ton of compliments… some people thought I was a mermaid, and some thought I was a peacock? But as soon as I showed them the picture of Rainbow Fish they got it.